PCI DSS Requirement 9 is fully dedicated to the physical security of cardholder data and how to protect it from criminals. Stealing cardholder data is not limited to hacking wizardries done remotely on computer systems. Criminals often attempt to access cardholder data by physically stealing hardware containing the data (a database server, a computer containing excel files and so on) or paper receipts with cardholder data (for business processing Mail Order which is quite common). Another very common practice is tampering with or substituting legitimate card reading devices. In general, throughout the PCI DSS the term “media” is used to identify any kind of support (papers, disks, computers etc..) that contain cardholder data. As criminals may gain access to those supports and steal data, the PCI SSC has spent 5 pages of their latest version of the security standard - PCI DSS 3.1 published in April 2015 - on this particular requirement. To help protect cardholder data from a physical point of view, the PCI DSS Requirement 9 has been created with 10 sub-requirements. Each one of them is dedicated to a different aspect of the physical security, and explains how to complete some particular tasks. Let’s focus on the sub-requirement 9.9 for the moment, and try to break it down to understand what it means to comply with it for organizations that accept payments through a card-reading device or terminal and that want to achieve PCI Compliance. Who should comply with PCI DSS Requirement 9.9? Complying with requirement 9.9 applies only to organizations that accept card-present type of transactions, based on face-to-face interactions between the cashiers and the customers. The most common devices that allow this type of transaction are the PoS (Point-of-Sale) and the PED (PIN Entry Device). Whether your card-reading devices or terminals are standalone dial-out terminals or connected to a network, they fall into this category because they involve a physical interaction with payment cards and cardholders. 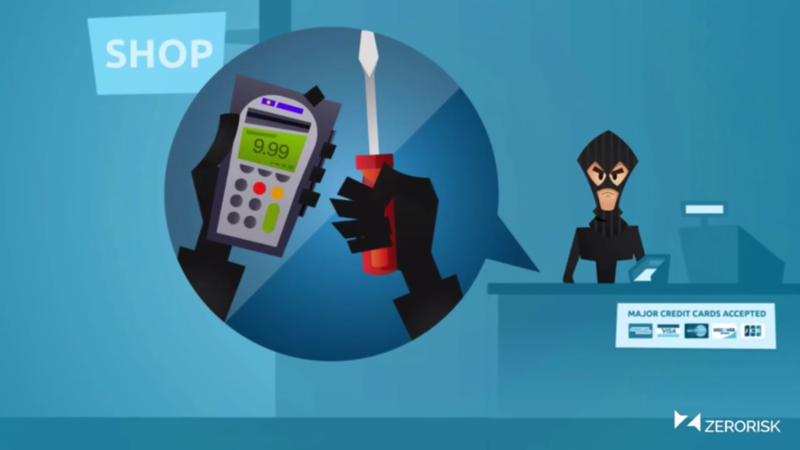 Protecting devices and terminals is the only way to prevent criminals from tampering with them, steal or replace them with manipulated ones, skim components, attach additional devices with the goal of collecting cardholder data while the transaction happens. This means that it’s strongly suggested to protect any type of device that allows cardholder data to be entered with the goal of accepting a payment. Other method of unique identification. Maintaining this list up to date is what organizations have to do to comply with this PCI DSS requirement. Most of them carry this task using complex spreadsheet and doing a lot of manual work. The task is theorically easy to complete when you deal with one terminal only and you are a very tidy manager, but it becomes more complicated with a growing number of terminals to keep under control, especially if they are used in different locations. The goal of this task is to detect tampering, skimming or substitution of card-reading devices and terminals. The main asset needed to complete this task is the creation of procedures on how to inspect devices. These procedures have to be documented and the personnel must learn how to apply them in order to understand if any of the devices has been tampered with, skimmed or replaced. The PCI DSS 3.1 documentation suggests a few ways to inspect each device according to the type of device. Taking pictures is a great way to compare a device’s current appearance with its original appearance to see whether it has changed. A secure marker pen (such as a UV light marker) is a good way to mark device surfaces and device openings, so any tampering or replacement will be apparent. In fact, tampering techniques include the replacement of outer casing of a terminal for instance. The risk of tampering, skimming and replacement of card readers grows when these devices are left unattended. In such cases, it is important to inspect them more frequently than devices that are constantly under control or in direct contact with the onsite personnel. Instruction about the type and frequency of inspections depend on the particular organization and are included in the documentation created to explain the inspections procedures. Last but not least, all personnel should be trained to apply the procedures created to inspect the payment card readers. Criminals might be able to get physical access to an organization appearing as authorized maintenance personnel. They use a series of tricks to do that, such as camouflage and acting, or simply sending new devices to a specific address’ location with instructions on how to install and use them. Their goal is to get in touch with card-reading devices or have their own ones in use. This task can be completed in various ways. For instance by checking internally with colleagues who can confirm the identity of the third-party personnel or even better by calling directly the POS maintenance company and ensure that they are real employees. Beware and report about suspicious behavior around the devices (to avoid tampering and substitution). Keeping documentation always up to date for each point-of-sale locations. Running interviews to a sample of personnel to make sure that they have received training as expected. Requirement 9.9 is a relatively new one. It was published with PCI DSS 3.0 and it evolved with PCI DSS 3.1. It is currently effective from the 1st of July 2015, this means that not complying with it today reflects to not being PCI Compliant. The most common problems experienced by organization with this requirement are related to planning and amount of work to carry. Organizations may forget to inspect their card-reading devices and terminals regularly and they would benefit of reminders and notifications. The devices to protect and monitor might be several, and spread over a large territory. Organization would enjoy a centralized database and a dashboard from which they could monitor each location and terminal in use. Take a look at ZeroRisk PINpoint! If you are an organization that uses card-reading devices and terminals, you must protect them and you would benefit from the use of a solution that helps you do this in an easy and cost effective way.